Place and Finish As the name applies, Place and Finish is the physical pouring and finishing of the cement. The area of flooring to be laid is readied for pouring. As the pour begins the cement is "Placed". Depending upon the size of the project and constrictions it may be placed either by pouring directly off trucks, power buggies, or pumped into place when physical access for the truck is not available. Next a process called screeding is performed to "rough" level the cement. The crew cross-checks the flooring with a device called a darby to close up the surface. Then its time for the finishing process. A float machine now compacts the surface. Every time the machine makes a pass it makes the floor more dense. As it is in the setting process you switch to troweling machine that will give it a final smooth surface. Laser Grading of Sub-base Picture your typical road grader on a highway project shrunk down a quarter of the size. This device has laser guided blades to level the sub-base prior to the pour. 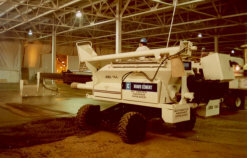 Laser Screeding Laser screeding is a mechanical device the lowers the amount of manpower needed to level flooring on large projects while increasing the amount of pouring possible in a day. 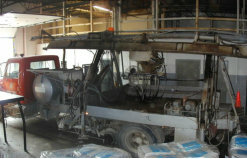 The amount of concrete that can be poured in a day can be double that of conventional equipment by using this process. It also raises the accuracy of the floor levelness. Supply and install of steel fibre re-enforcement Steel fibres is the reinforcing used in concrete to give it higher tensile strength. This would be used more in industrial projects. This product is designed to take the place of reinforcing bars. The fibre is mixed directly into the concrete on-site just prior to the pour. This helps to reduce cost because it is not as labour intensive as laying conventional reinforcing rods. Hardened floor surfaces-Metallic, Non-Metallic, Wear resistant Spark proof, Dust proof These products are addatives that are troweled into the concrete during the finishing process to increase the durability and wearibility of the concrete floor. Metallic are steel chips and non-metallic are natural aggregates used to resist wear. The preference between the various hardeners depend upon cost and the application of the flooring. Coloured Flooring A shake applied hardener with colour pigmentation to give a desired colour to the floor. Chemical resistant and/or abrasion resistant toppings This is for specialty type applications where heavy traffic occurs and/or the surface may be subjected to harsh chemicals. 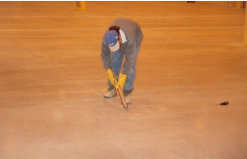 This is a super heavy-duty application that is a monolithic topping applied as part of the floor slab surface. Super Flat Floor Systems A process where extremely flat and level floors are required for high-racking systems. This is a system of pouring floors to extremely fine tolerances. A more labour intensive process using similar methods of leveling and finishing but only to a higher degree of accuracy... more time spent screeding and finishing means a more precise floor. 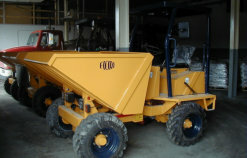 Grinding Is a process for repairing damaged services possibly due to frost or rain. It can also be used as a means of creating a decorative finish. Joint De-lamination Repair of dusting floors Floors that tend to become dusty due to age or improperly finishes can be ground and coated with a liquid hardener. Sealers used are VOC compliant and urethane coatings to protect new and used floors. Floor Saw-cutting There are two types of saw-cutting. Saw-cutting for controlling of cracks on newly installed floors and saw-cutting prior demolotion of concrete. We can cut up to 20 inches deep. Wall Saw-cutting Instead of cutting on a horizontal surfaces, wall sawing iis for vertical surfaces using a special equipment specially designed for vertical work We can handle up to 15" deep. 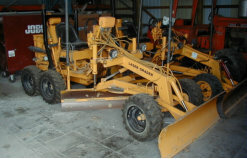 With access on both side it is possible to cut up to 30" deep. Used once again for demolition purposes but also for creating new openings such as doors or windows. The process does not damage the structure of the wall. Road Curb cutting To create new driveway entrances and parking lot entrance and concrete ramps for handicap. Cutting is compliant with City of Windsor By-laws. Concrete Removal services After cutting and/or demolition of concrete we can remove and dispose of concrete. Core Drilling Drilling holes in concrete may be needed for mechanical and electrical contractors for any needs to go through concrete floors and walls. We can drill from 1/2" to 15" in diameter and normally no limitation to depth. 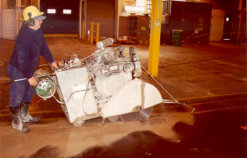 Joint Sealing To seal control joints after saw-cutting to extend the life-span of flooring subjected to heavy industrial traffic and preventing debris from getting into the cracks. Asphalt Crack Sealing On asphalt surfaces the cracks are routed out and sealed with hot pour rubberized asphalt to prevent water from penetrating through to the base of the asphalt. Grouting Used anchor bolts or under newly installed machine bases and steel plates used for weight bearing support. Waterproofing Can be used in many places such bridge and parking and roof decks prior to installing asphalt. Hot or cold applied materials are used depending upon the application.